I’ve got you covered if you’re looking for a chocolate, candy bar craving slayer that’s clean and plant-based. These chocolate-covered mixed nut bars are topped with a gooey caramel made from dates combined with crunchy nuts. You can adjust the recipe to include your preferred nuts and nut butter. I used almonds, cashews and a combination of almond butter and peanut butter, but there are many possibilities! 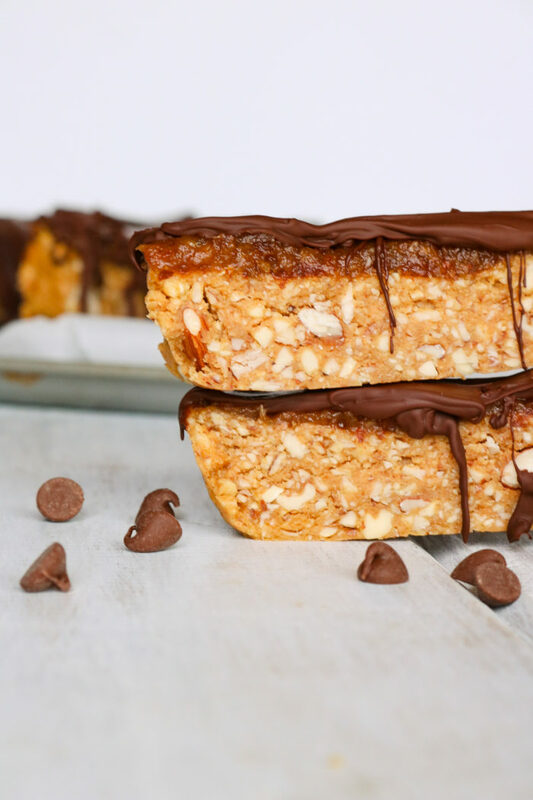 I feel like these bars fall somewhere between a Larabar and a Snickers bar for comparison purposes, and they store beautifully in the fridge, so you keep them on hand all week long. 1. Place the ingredients for the base of the bars (including the nuts, maple syrup and nut butter) in a food processor. Pulse and process until it comes together and the nuts are broken up within the nut butter and maple syrup (note: this will be a thick mixture). 2. Line a loaf pan or dish with parchment paper and pour the bar mixture into the pan. Press down into the pan and smooth out the top with a rubber spatula. 3. Place in the fridge for 30 minutes. 4. While the base of the bars is setting in the fridge, place the pitted dates in a food processor or high speed blender. Add the hot water and maple syrup. Process until a gooey sauce is formed. 5. Once the base of the bars has set in the fridge for approximately 30 minutes, pour the “caramel” sauce over the bars and return to the fridge. Allow to chill in the fridge for another hour. 6. Remove the bars from the fridge and lift the parchment paper out of the pan. 7. Using a double boiler, melt the chocolate chips. 9. Top the bars with the melted chocolate. Use a rubber spatula to smooth out the chocolate. 10. Return to the fridge to chill and allow the chocolate to set for 30 minutes. 11. Store in the fridge in an airtight container. Enjoy!